My sister gave me a nice selection of candy bars from a Lebanese grocer recently, and it's about time I got to reviewing them. The first one I tried was the Unica bar, a chocolate wafer bar. It's worth mentioning that I have never been a fan of wafer bars. I didn't even like KitKats until college, and those plain delicate wafer cookies? Still not for me. So I am somewhat biased. 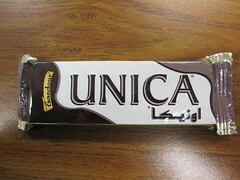 The Unica bar was very pretty, with a nice-looking, rippled milk chocolatey coating. It smelled pleasant, like a mild cocoa. The chocolate was extremely mild, in fact. It got a bit lost in the wafers, which were also subtly flavored. The cream between the wafers was slightly salty with a hint of vanilla. They had a light, delicate crunch, which was really the main experience of the bar. 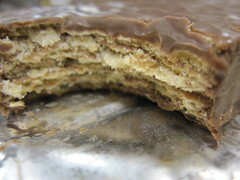 It felt very unsubstantial, but as I mentioned, wafer bars are not my thing. The wrapper said Wafers coated with milky chocolate sensation and the website says Wafers Coated with Chocolate Flavour, so draw your own conclusions about that. There's nothing really wrong with this bar, but it's just too bland for me. not a wafer fan, even nutty bars? Those are my least favorite snack ever. I just stumbled across your blog and was pleasantly surprised that you had reviewed Unica! As a child living in the US, I always remember the smell of Unica & Lebanese coffee in my grandmother's suitcase when she would visit us from Lebanon. I would inhale them like a monster! Now I am living in Lebanon and I am so sick of them haha. Ghandour is not really the most gourmet of Lebanese snacks, it's actually the cheapest you can find. Most of the younger children love it because you can buy like 6 pieces of their products for about 75 cents.